I have a trip planned to Sierra City and want to check out Sierra Buttes, then work our way up to Gold Lake area, conditions permitting. Any mild trail suggestions between those to points, or in the area? I know theres a bunch, did some google searches, have the Cal topo usfs maps, but looking for some first hand input here. CJ7 on 31s, 3" lift, locked and geared properly. Limited on ground clearance and would prefer to keep sheet metal straight, but not afraid to wheel it. Definitely want to explore outside the usfs roads, just don't want to end up in some fordyce level sh!t. Any info would be appreciated! Thanks! From Sierra City take Butte Road uphill toward town dump, then on right take the trail that zigs up the south face to the saddle, then it shoots north toward packer saddle. you will pass on the right the uphill turn to the buttes lookout. (look for smallish sign) Expect drifts in the trees but when its all dry, its an easy SUV run. Last summer at the very top parking lot for the lookout there was a subaru forester. Or skip the buttes side trip and keep on north toward packer saddle. Cross over pavement and keep northbound on gravel road. eventually will tie in with the gold valley split. left takes you down into gold valley, or keep straight and veer right will lead to summit lake and then drop down into Gold. I was in this area last summer. 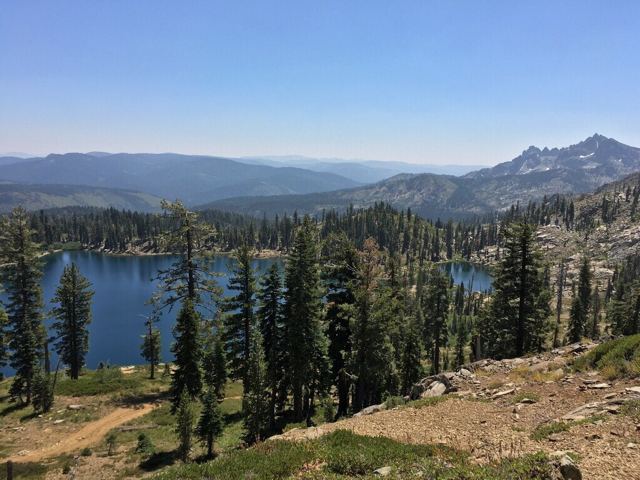 After visiting the Sierra Buttes, we took the Deer Lake trail to Summit Lake before heading to Gold Lake. Pretty drive. Running on water and hamsters. if you are feeling ready for full-awn crawling, at summit lake, go left to oakland pond, then descend down to snake lake, then left at spillway over to little deer lake, then back up hill to the ridge top. This is about the toughest trail in the area. or from snake, keep west and drop into gold valley and from there right turn takes you to qraeagle-ish, or a left down to pauley creek/butcher creek and then back up ridge to the ridge road. OTOH, we like the area around wild plum campground. Or from Bassets go straight south and pop out at jackson meadows. There is Mills Peak LO, Frasier Falls or if time, drop down to downieville and left/south on Galloway road (past the sheriff's office and the hangman's gallows) and work your way up the ridge to henness pass. Lots of good stuff in the general area. Last edited by RARECJ8; June 29th, 2017 at 01:42 PM. Yup, easy enough trail for my 45 year old Wagoneer on 33's to make it. Some ledges and stuff might be fun for a stock vehicle, but my truck had zero issues and its a pile. Any word on snow around Gold Lake? Thought it might have drifts in the road until August this year. We were at Gold Lake 4x4 campsite last weekend, the trail there was pretty wet and There was snow on only the tallest mountains that you can see from there. If you go anytime soon, expect some deep snow patches in the shade. Currently along Interstate 80 area there are still significant road closures above 6000'. Snow, washouts, AND downed trees. Otherwise RareCJ8 picked a nice route for you, NOT Fordyce, lol. Used to be you could drive down to Deer Lake and laugh at the PCT thru-hikers carrying all their gear, while you float in a raft with a cold beer. But I haven't been that way in 15 years, and since the Forest road inventories things have changed.